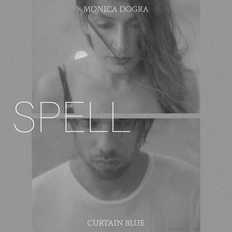 Curtain Blue is Abhishek Bhatia's solo project. Vocalist of a Delhi based band, The Circus, Abhishek has also been producing his own electronic music and has finally decided to take it live in the Curtain Blue avatar. Fusing haunting vocal melodies with down tempo and bass sensibilities, he aims to create a textural blend which can uniquely be called his own. Curtain blue draws inspiration from artists such as Radiohead, Apparat, Moderat, Jon Hopkins, while creating a niche for itself. For the live setup of Curtainblue, Abhishek has collaborated with guitar player, Viraj Mohan, also known for Karijimo and AVR, bass player Nikhil Rufus Raj, known for suerpfuzz, indigo children, karajimo and the Drummer Anshul Lall, known for The Circus, Ioish. The live setup gets an alternative electronica and industrial vibe to the music and is a 4 piece band on stage. Over the last couple of years, Abhishek Bhatia has performed at a number of festivals in India and abroad, including The Great Escape Festival at Brighton, UK, Bacardi NH7 Weekender and the flagship edition of the Magnetic Fields Festival in Rajasthan in 2013 & 2014, where Berlin/ Los Angeles-based producer Robot Koch saw him perform for the first time. Their initial meeting led to a musical collaboration between the two on Koch’s acclaimed ‘TSUKI’ EP, released via MONKEYTOWN Records earlier in 2015, and Koch's debut album "Hypermoment" in 2015 via MONKEYTOWN RECORDS again. April 2015 saw Curtain Blue release his debut EP, ‘Drones’. The four-track EP struck a brave venture into a weird, wonderful and unchartered territory of modern electronica where no Indian producer has really succeeded. Equal parts headphones listening and dance floor friendly, the EP features some skillfully produced, textural percussive elements and haunting vocals. To support the debut EP, Curtainblue toured the country and abroad at numerous dates during April and May, covering venues like The South Bank Centre, UK, The Great Escape Festival, Brighton UK, Bristol, Glasgow, Scotland and all parts of India.